The trend of making film sequels is not new to cinema. As a matter of fact, it's one of the easiest ways of minting money. Rather than establishing something from the scratch, it's far easier to build upon an existing conception. That's the basic driving force behind making film sequels. But, what about the efficacy of sequels in comparison to their predecessors? Mike Anderson of NerdWallet.COM, a personal finance website that helps consumers find ways to save on everything from gas to checking account fees to entertainment, recently conducted a study to look into the same. And the outcome of the study was been quite revealing indeed. 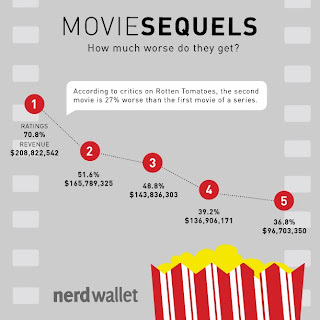 It was found that the returns of film sequels diminished considerably compared to their predecessors, both in critical reviews and at the Box Office (USA alone). Pirates of the Caribbean 4 earned, on average, 33% from the critics at RottenTomatoes.COM. How much worse could the fifth installment be? According to the calculations, it’ll earn a 31% rating – 61% worse than the original. The fall of Pirates of the Caribbean is particularly spectacular in comparison to most series. By the time of the fourth movie, critics were already extremely displeased. In 2003, everyone loved watching Elizabeth and Will sail off on the high seas. But with the fifth movie coming out in 2015, no one knows how much longer he/she can take Captain Jack’s drunken puns and raccoon makeup. It wasn’t always this bad. After the highly successful first film, everyone was itching to see the sequel. And it showed: Pirates 2 earned $100 thousand dollars more than its predecessor. But were the third and fourth sequels truly necessary or are the producers just trying to milk the franchise cash cow? The general trend points to the latter, as you can see in the table above. All in all, when the fifth movie rolls around, on average, it is 48% worse than the original. Note: The dip in quality was measured by percentage change, not percentage difference – the difference between the first and fourth’s average reviews is 46%. 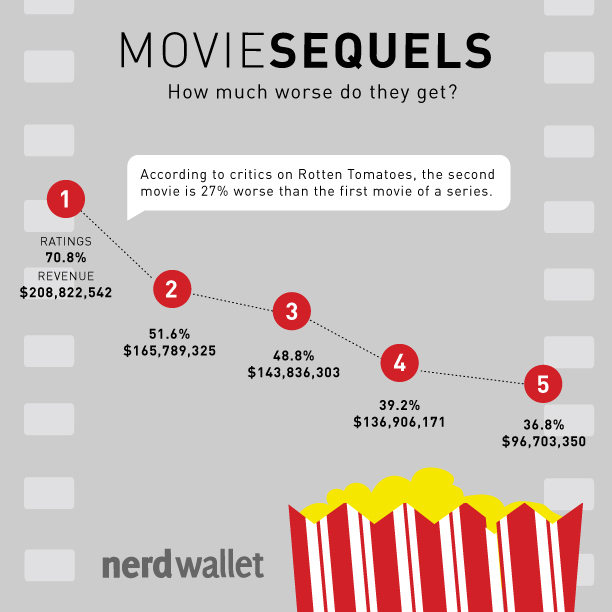 NerdWallet averaged reviews and box-office data for 130 series, which included 475 total films. Critical reviews were collected from Rotten Tomatoes and box office revenue figures from Box Office Mojo. Box office revenue was adjusted for inflation. Note: Extended film franchises like James Bond were excluded from this analysis.